In the 7th Country of Christmas my true love gave to me: 7 trumpeters trumpeting. 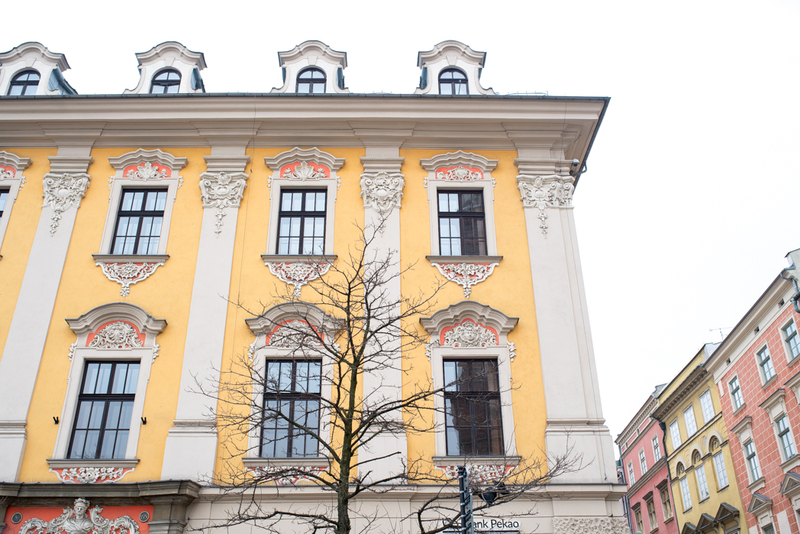 Our visit to Poland was probably the least “Christmasy” of all the countries we visited as a part of our #12CountriesofChristmas Tour – because we allocated most of our time to visiting significant WWII sites which was difficult and deeply moving. That said, we extended our stay to 3 days because there was so much we wanted to see, do and eat! 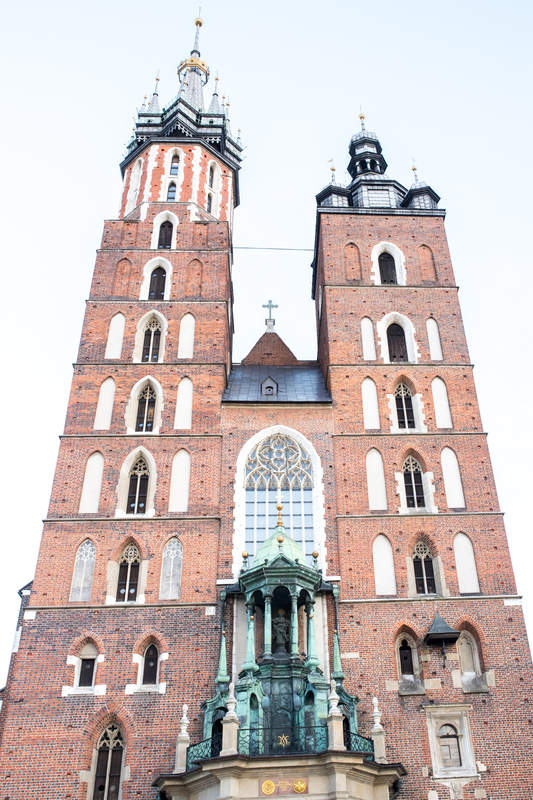 St. Mary’s Basilica was a highlight of our visit, and we were lucky enough to walk up to the church at exactly 3pm, as the famous Trumpeter of Krakow was sounding his trumpet from the church tower. 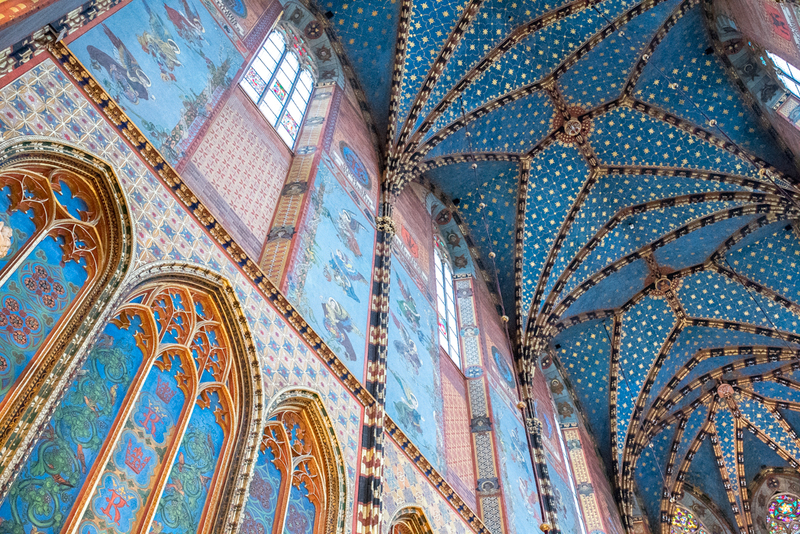 We knew about this ritual, dating back to the 1300s when the trumpeter would sound the alarm in advance of raids by the Mongols, and which is also the title of a popular children’s novel. 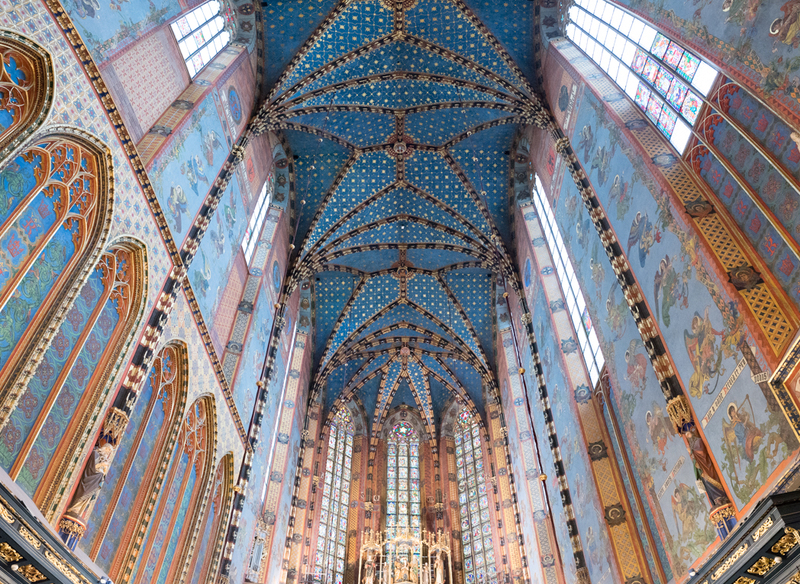 The trumpeter sounds a five-note Polish anthem every hour on the hour, four times in succession in each of the four cardinal directions, from the highest tower of the city’s Saint Mary’s Church. 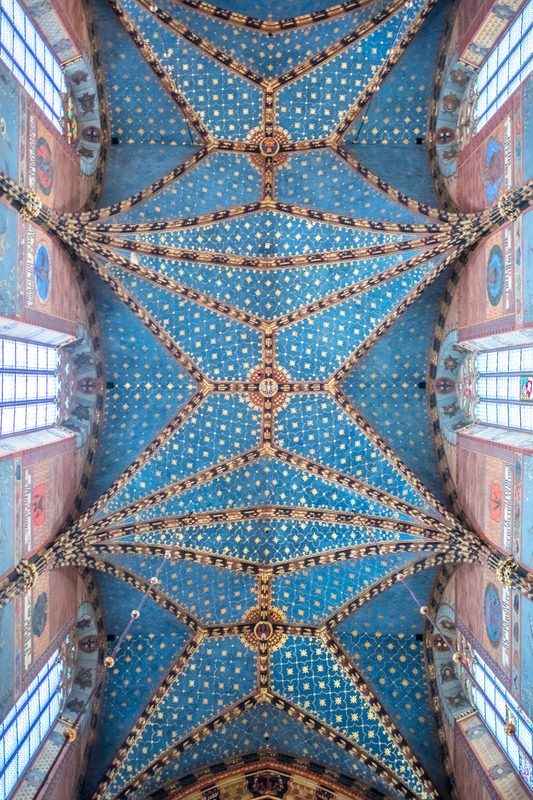 Once inside St. Mary’s we spent at least 45 minutes craning our necks to take in the spectacular painted nave and ceilings, as the strains “Oh Holy Night…the stars are brightly shining” wafted through the nave. This visit was one of my favorite moments in all of December, as I felt the awe and wonder of the Christmas Story standing in such a beautiful space. 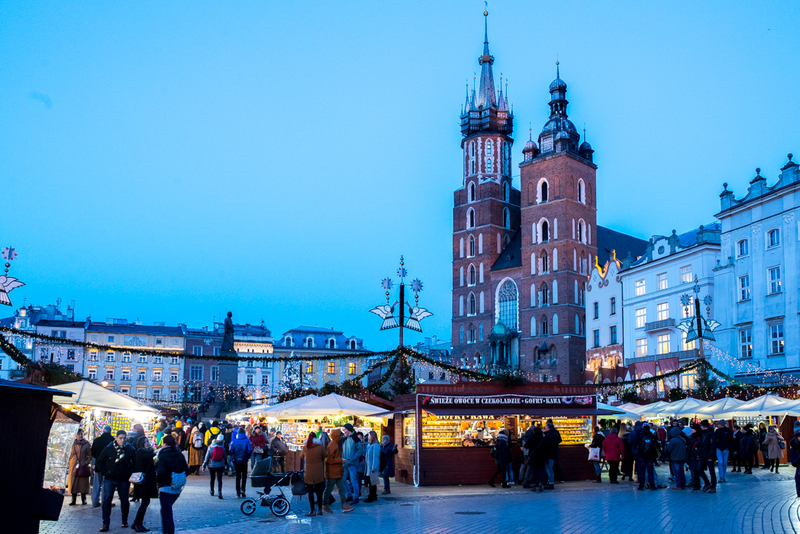 Outside of St. Mary’s, Rynek Square is full of merriment and the site of the city’s Christmas Market. 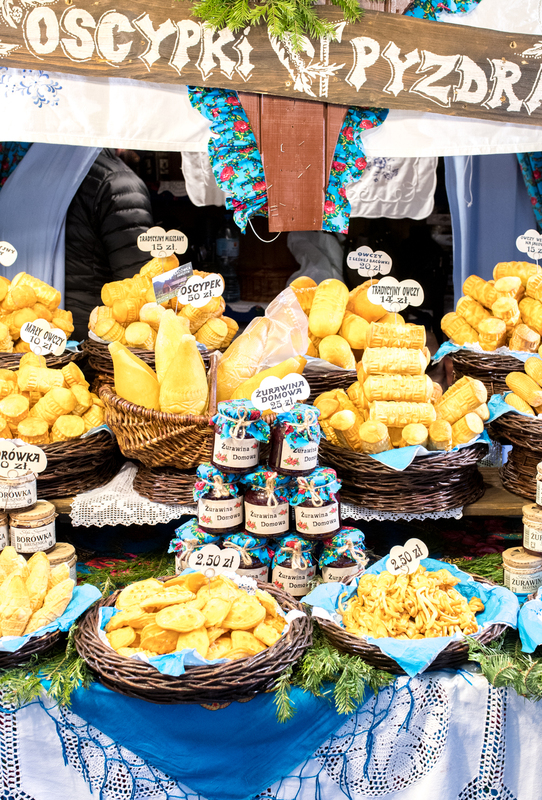 David was excited to enjoy a lot of traditional polish foods he remembers from growing up near Chicago, and as we wandered through the market we stuffed ourselves full of pirogies, kielbasa and oscypek, a smoked cheese made of salted sheep’s milk served with tart cherries. 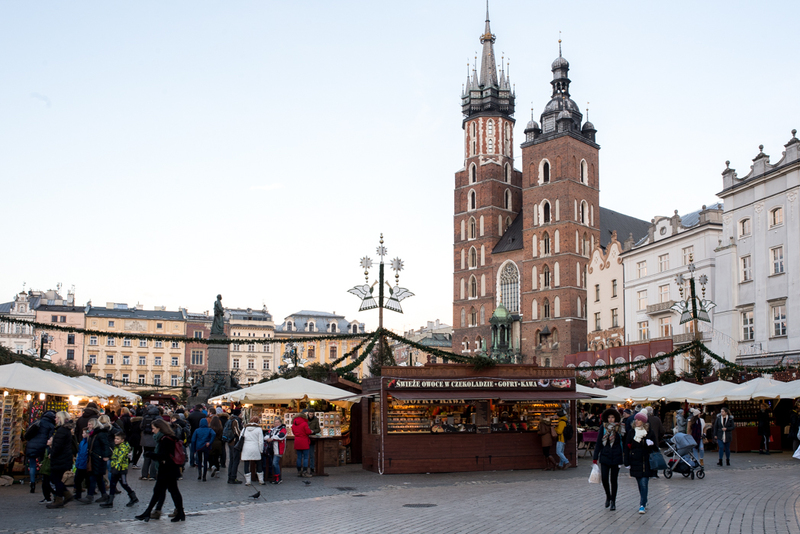 The market is one of the largest in Europe, and the plaza it occupies is the biggest city square in all of Europe. 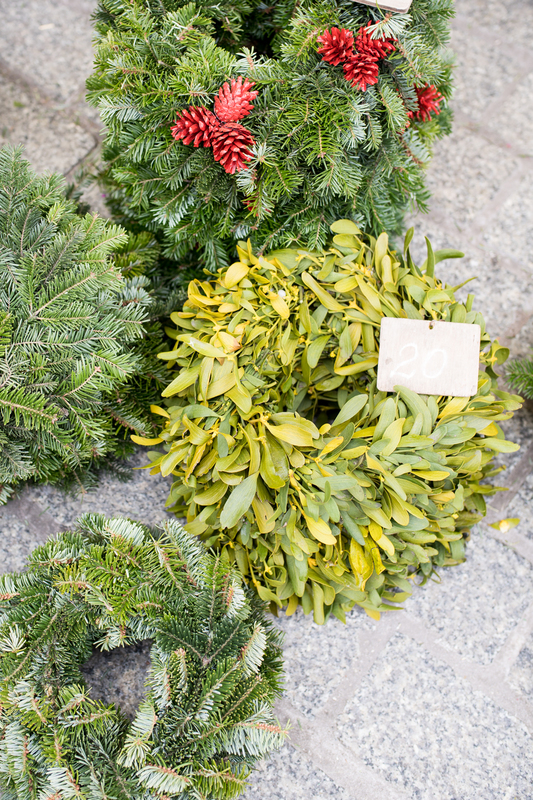 While Krakow’s Christmas market wasn’t as “design-y” as, say, Helsinki’s, I do recommend it for the diversity of food and gifts on display in the stalls. 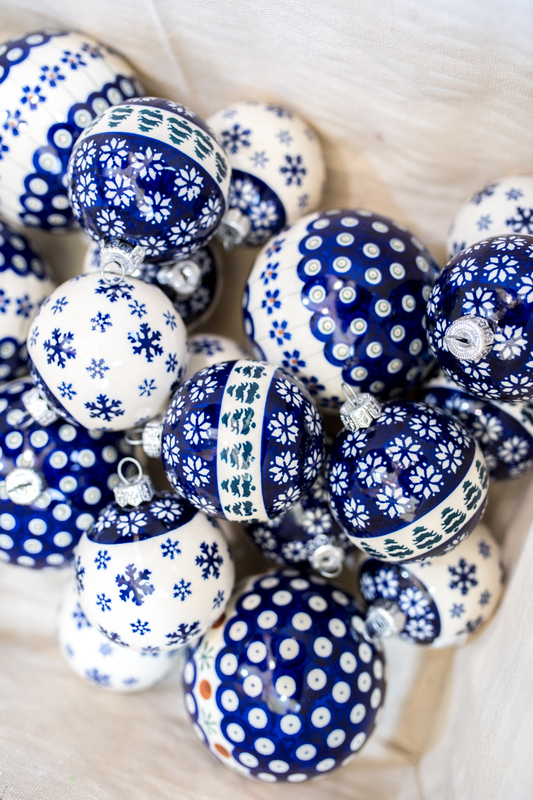 I fell in love with Polish pottery, and we picked up several ornaments with a snowflake and fir tree design – they have so many beautiful patterns! 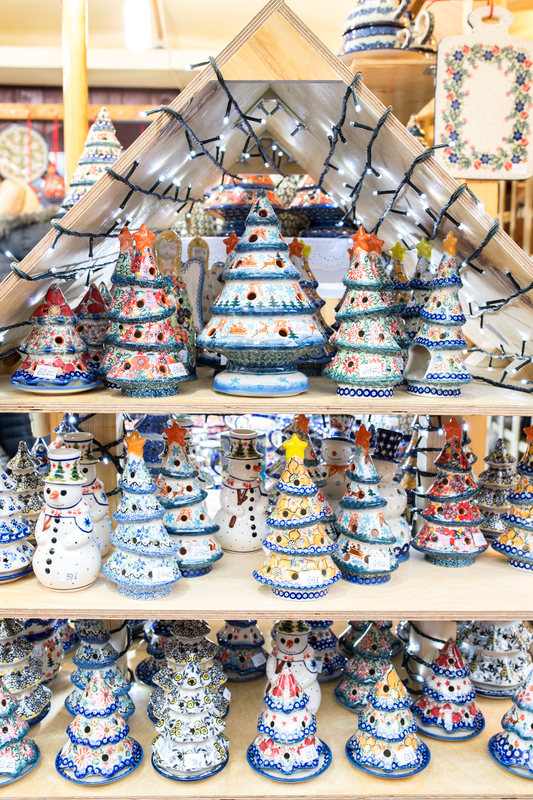 We regretted not buying a few other dishes from the stall and we’ve been on the hunt for mugs with the same design as our ornaments ever since. 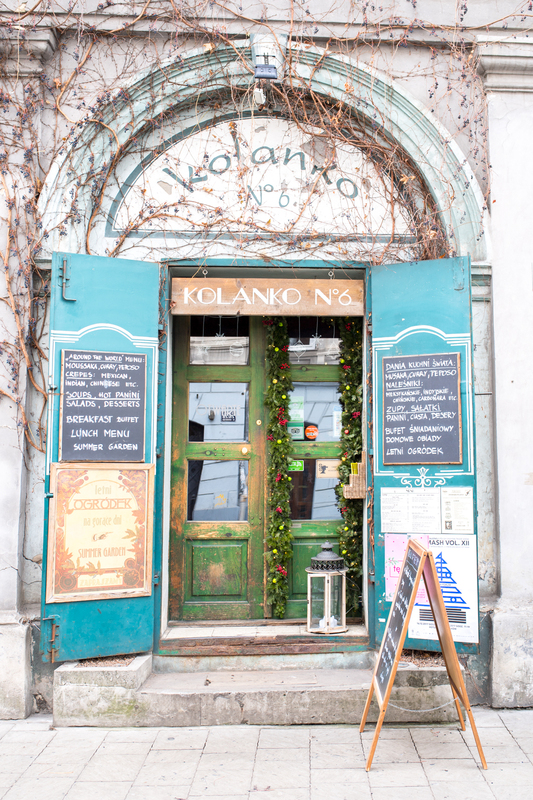 We really did come to Poland to eat. 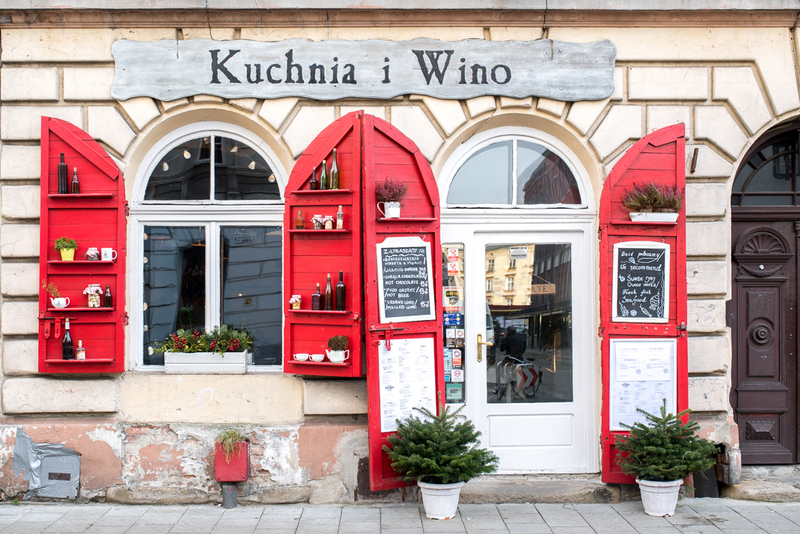 We stayed in the Kazimierz which had a really fun, hipster-vibe and lots of charming restaurants and independent shops. 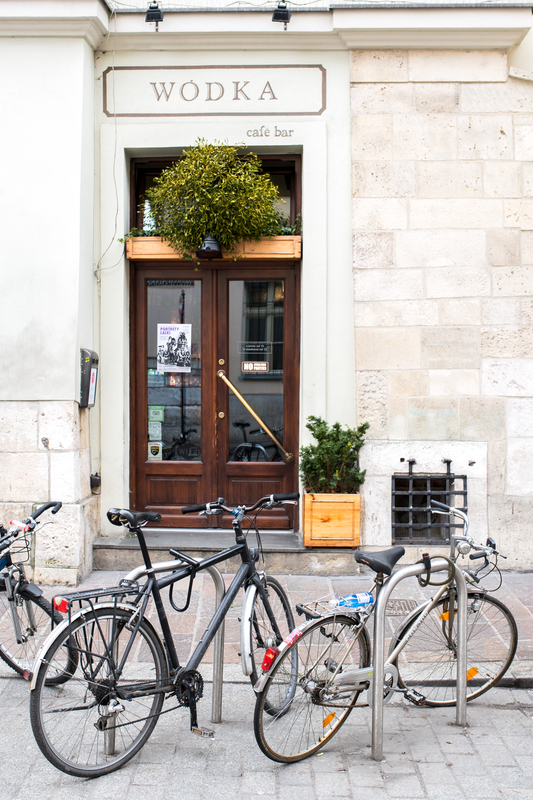 I loved sampling local foods during our first lunch at a spot called Barfly – their bean and sausage soup was so simple but so memorable too! Down the street I’d recommend Mleczarnia for drinks, then join the locals ordering zapiekanki from the many kiosks in Plac Nowy Square. We ordered twice from Zapiekanki u Endziora and the “Royal” was our favorite! Zapiekanki are similar to pizza, consisting of a toasted baguette smothered in hot cheese and toppings. 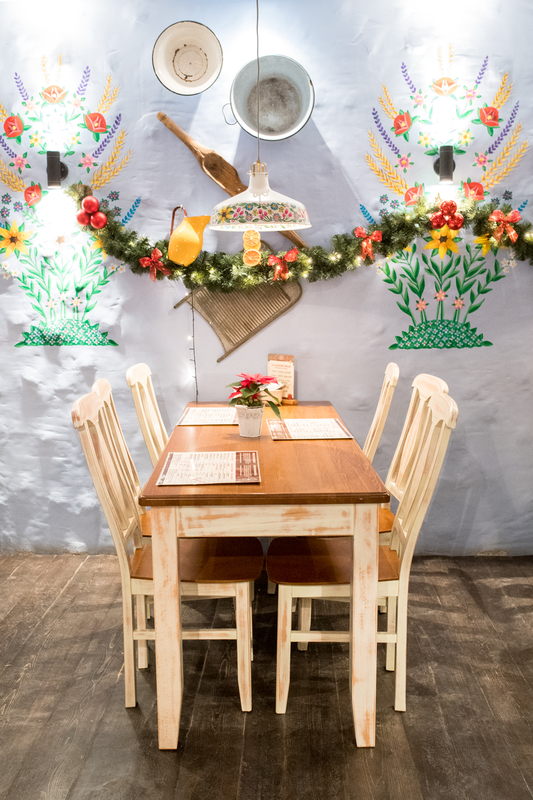 Other favorites included: the amazingly cheap and delicious pirogies from Przystanek Pierogarnia, a little hole-in-the-wall shop with only 5 stools and walls covered with love notes (to pirogies! 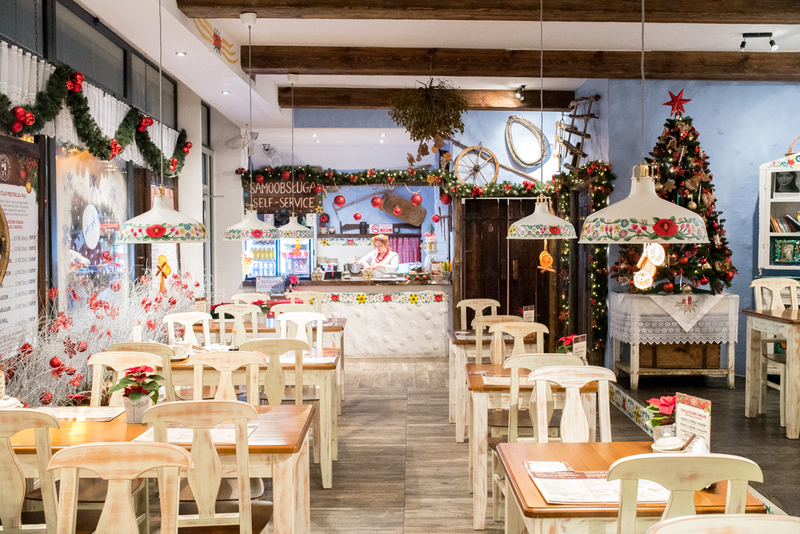 ), and we also enjoyed the charming decor and pirogies from Pierogarnia Krakowiacy closer to the old town.